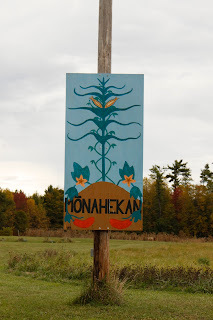 When Nicolet in 1634 stepped ashore not far from the present site of Green Bay, the Menominees were living in peace with their neighbors on both sides of the Menominee River, on the present sites of Menominee, Michigan, and Marinette, Wisconsin. Language and legend stamp them as Algonquians. Their name was bestowed upon them by the Chippewa and means "The People of the Wild Rice." As white settlers encroached on their lands and treaties were made with the U.S. Government, the Menominees moved reluctantly from one place to another. By 1831, they had transferred to eastern Indians half a million acres at 4½ cents per acre and another half million acres to the Government at 5½ cents per acre, the money to be paid in annuities. When Wisconsin became a Territory in 1836, they were compelled to sell 184,320 acres through the Fox River Valley for settlement and lumbering at 17 cents per acre and they had to move again. In 1848 the Government sought to move them to the Crow Wing country of Minnesota but this time the Menominees under the leadership of Chief Oshkosh refused to move. In 1852 they moved up the Wolf River where in 1854 they were granted ten townships, the present Menominee Indian Reservation. The marker is located on northbound Wisconsin Highway 47/55, north of its intersection with Strauss Road, Shawano, Wisconsin 54166. The marker is included in the From the Pineries to the Present Tour No. 1. The marker is hidden inside the shrubbery. Plenty of signage leading up to the marker's location. This beautiful mural is further down the road. The marker is located in Keshena, Wisconsin.